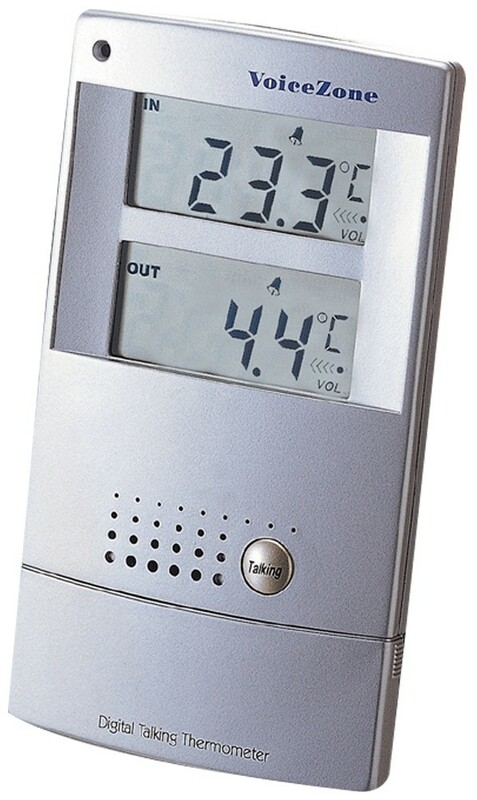 Check indoor and outdoor temperature with one button. Can announce temperatures in Fahrenheit or Celsius. Alerts you when outside temperature drops below 32 degrees or above 100 degrees. Easily check each day's high and low indoor and outdoor temperatures. Mount on wall or stand upright on a window sill. Simply place near window and put 10-foot probe out window for outdoor temperature. 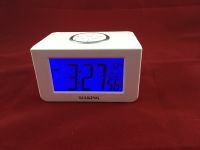 When visual clock is set, toggle hourly temperature on or off between 7:00 AM and 9:00 PM. Boasts classy, elegant silver finish. Measures about 6 in by 3 in by 1 in. Directions for the Talking Indoor-Outdoor Thermometer From Future Aids, The Braille Superstore. Place your new thermometer on a table in front of you, with the screen facing away from you, and the probe on the left. Place the probe outside (such as through a window) so it can sense the outdoor temperature. The unit takes 2 AAA batteries, and the battery compartment is on the reverse side below the screen. 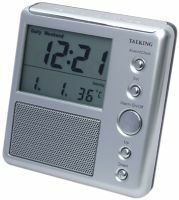 Press the button to the right of the speaker (Talk) to hear the indoor and outdoor temperature. This thermometer has a visual clock that does not talk and cannot be set audibly. If you can't get a friend to set the time for you, put the batteries in at midnight. There are 10 function buttons directly below the speaker and talk button. Slide back the plastic cover (on the end of the unit closest to you) to access these buttons. --Bottom row, 2nd from the left: Temperature switch. Left position speaks Celcius, right position speaks Fahrenheit. --Top Right: Speak the day's high and low temperatures. --Bottom Right: Speak the all-time high and low temperatures since the unit was powered up.